The results of our recent poll asking how to make a Crown Victoria more cool than it already is ended in a tie between adding spinners and adding a for sale sign. We'll we've traded in the Crown Vic and moved into something a little more "Green." I'm not sure about the 'cool' factor, but we like it. Oh Yeah, check it out. By the Way: If you have trouble viewing this video (I made with my little Flip Video camera) let me know. Some have asked about the picture at the top of this blog. FYI: It is a picture I took while Leisa and I were visiting Sedona last year with Craig & Melissa Rapp. Sedona is a remarkably beautiful place about 2 hours north of where we live. We rented a new Jeep Rubicon and went off-road. Come see us, and we'll take you there as well. Monday, we hit a record high of 110 degrees. Friday, we barely hit 70 and had a lot of rain. Which of course is great for us. Leisa and I did a little running around and when we came home we were surprised by the little lake on the corner of our street. 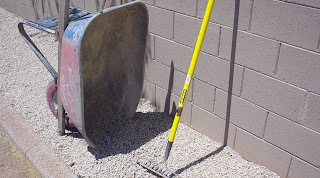 3 Wheelbarrows - To move it all from the front to the back yard. 2.5 Hours - Pretty Amazing to move it and spread it. 1 Very Thankful Guy - Me! I'll let you know when I'm ready to put down the artificial grass. If you have ever watched 'Lost' on ABC, you already have a lot of questions. If you've never watched 'Lost', the best I can do is encourage you to rent the previous seasons and catch up. Essentially however, Lost is about a group of plane crash survivors on a very strange Island with mystical powers and dangers. 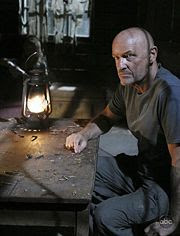 John Locke, one of the key survivors is seeking answers from a mysterious and as yet unidentified man named Jacob. When he enters the dark cabin he sees someone sitting in a chair. "Are you Jacob?" Locke asks. "No," the man answers, "But I can speak on his behalf." Lock asks, "Well, who are you?" "I'm Christian," comes the answer. Well, let me say this is a mind bender. As the conversation continues, John Locke, hears a noise behind him and turns to find Clair, another survivor who has recently disappeared. "Hi, John," she calmly says. John is now filled with even more questions; "What are you doing here?" "Where's the baby?" "Why is she here?" Christian interrupts John and says something very important, "We don't have time for this. The people from the boat are already on their way back, and once they get here all of these questions won't matter one bit. So why don't you ask the one question that does matter." Wow! That hit me like a bolt of lightening. Why don't you ask the one question that does matter! As Christians, we often waste too much time and energy asking questions that in the end don't really matter. And we're not the first. Why does your teacher eat with tax collectors and sinners? Should we pay taxes to Caesar? In the resurrection, whose wife will she be? Can we have a kitchen in the church building? Do we have to wear a tie to wait on the Lord's Table? Can we clap during a song? Can we preach about the birth of Christ at Christmas? The resurrection on Easter Sunday? And on we go asking questions that we really don't have time for, because Someone IS coming, and once He get here all of these questions won't matter one bit. The question John Locke asked doesn't really matter outside of the fictitious world of TV, but there are questions that we do need to ask. So here's my question to you: What is the one question that really matters, that you need to ask? This was a great weekend for the Wheelers. We are very proud of Chad - not simply for his achievement, but more for his character & faith in pursuing an education.